The Homeland Union – Lithuanian Christian Democrats (TS-LKD) leader Gabrielius Landsbergis has stabilised his leadership within the party and is seen as a unifying figure in it, while Lithuanian Social Democrat Party (LSDP) chairman Gintautas Paluckas currently does not hold much authority in the party and is a divisive figure, political analyst Tomas Dapkus told LRT.lt. Social Democrat leader G. Paluckas and his Conservative counterpart G. Landsbergis are two political leaders of similar ages, each leading one of the country's major political powers. The circumstances under which the two politicians came to leadership are also similar – there was desire for renewal and youth. G. Landsbergis was re-elected for his second term as head of the TS-LKD this spring. Though the Conservative leadership elections were to be held later, G. Landsbergis had them held earlier, motivating it with "wanting to reconfirm the mandate of trust after the Seimas elections." The Conservative party elections showed that the politician maintains trust, G. Landsbergis won with 62% of the vote. Meanwhile G. Paluckas was elected during the first ever Social Democrat Party leadership elections this April. G. Paluckas won with 5190 votes, defeating his closest rival Mindaugas Sinkevičius, who received 4781 votes. Both parties, the TS-LKD and LSDP alike, contain many experienced politicians, who have been working in Seimas for two or more terms. These politics veterans allowed individuals with far less prior political experience to take the reins. Up to becoming TS-LKD chairman, G. Landsbergis was an advisor at the government chancellery department of foreign and European affairs, later representing Lithuania in the European Parliament. Upon becoming the leader of the Conservative party, G. Landsbergis brought a number of young, but already known faces to Seimas – Radvilė Morkūnaitė-Mikulėnienė, Tadas Langaitis, Laurynas Kasčiūnas and others. He then managed to unite both the young generation of politicians and those who had already spent significant time in Seimas. It would appear that even the greater divide and disputes with the Christian Democrats have calmed – the party has united. Meanwhile G. Paluckas has worked as the Vilnius city municipal administration director, worked as the Social Democrat Party's executive secretary. G. Paluckas unsuccessfully ran for the post of Vilnius mayor, but was elected into the capital's municipal council and has been the Vilnius vice mayor since 2015. Already prior to taking party leadership, G. Paluckas pledged great reform which would impact a number of LSDP veterans. Recently G. Paluckas has been greatly drained by conflicts with the LSDP Seimas group. Group prefect Andrius Palionis intends to sign a cooperation memorandum with the "Farmers" which G. Paluckas has described as a slight. Why has one of these politicians succeeded in implementing uniting leadership, while the other's is less uniting and more dividing? Political analyst Tomas Dapkus says that G. Landsbergis has ensured his leadership in the party and is viewed as a uniting force in it, meanwhile Social Democrat chairman G. Paluckas currently lacks authority in the party and is a divisive figure. "G. Paluckas has the support of a little more than half the party because he is a populist, but he is not a uniting figure. He is seemingly fighting some sort of party nomenclature, but everything is a little different. He himself was an influential party member with Algirdas Butkevičius. He was the party executive secretary, which means he was the second person in the party, working with financing questions and other sensitive matters. We can see that the other young leaders do not support G. Paluckas – both M. Sinkevičius and A. Palionis," T. Dapkus said. Meanwhile G. Landsbergis, according to the analyst, not only has authority in the party, but is also nurturing the party's ratings. Furthermore G. Landsbergis has the trust of voters – he won the elections to the European Parliament and also won in his single mandate district of Žaliakalnis. 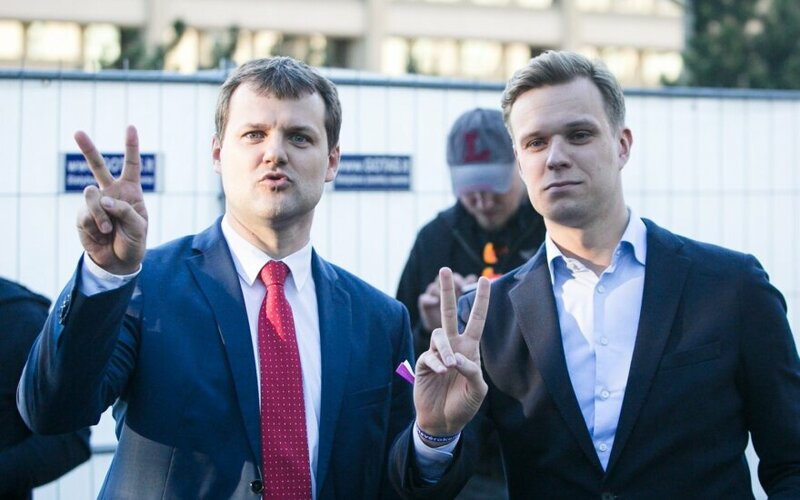 In terms of G. Landsbergis' failures, T. Dapkus points to the young leader not managing to become the Seimas opposition leader because he was unable to come to terms with the Liberals. Nevertheless, according to Dapkus G. Landsbergis' political career is not faced with any particular obstacles as of right now – Conservative ratings are on the rise and there is a high likelihood that Landsbergis could become the next prime minister. "Meanwhile G. Paluckas, when he ran for Seimas or Vilnius mayor, would obtain fewer votes than his party, so as a leader, rather than pulling the party forward, he was dragging it down. In all the cases he would lose the elections," T. Dapkus stated. The analyst believes that the two politicians' biographies should also be kept in mind – "G. Landsbergis finished prestigious studies, had a diplomatic career, was later elected to the European Parliament and finally elected party chairman and became a member of Seimas. At the same time G. Paluckas has one of the greatest political sins – the Supreme Court has tried him for political corruption. This is a massive stain which cannot be erased," T. Dapkus summarised, pointing out that G. Paluckas was able to leverage party members' discontent after the failed Seimas elections and receive their votes during the chairman elections. "But now G. Paluckas is acting as a populist – his desire to leave the coalition is also based on personal grudges. Let us recall how he changed his position after the Social Democrats did not receive the post of Social Security and Labour Minister in this cabinet. Former Social Democrat Party chairmen highlighted that there is also desire to leave the coalition with the "Farmers" because it would strike a blow to M. Sinkevičius – he would have to resign from his post as minister. He relinquished his post as Jonava mayor and is not a member of Seimas, thus he would be left side-lined," T. Dapkus observes. He states that it is unclear how G. Paluckas struggle for leadership will end. So far there is no ratings growth in sight for either Paluckas or the Social Democrats. "G. Paluckas also does not have much support among the youth. There are supporters, but they are very radical in leftist ideology," T. Dapkus says. Vilnius University Institute of International Relations and Political Science (VU TSPMI) professor Tomas Janeliūnas says that the current question over the coalition's future is crucial for the Social Democrat Party. "Of course not everyone likes G. Paluckas desire to withdraw from the coalition, this particularly applying to the group. Will G. Paluckas manage to create a success story? It will depend on whether the will stabilise the party or not. Naturally there will later be internal discussions whether the right choice was made and it will likely decide how much the chairman's influence will wax or wane in the party," T. Janeliūnas summarised. VU docent, political scientist Lidija Šabajevaitė says that it is time for G. Paluckas to calm his personal ambitions and sit down at the negotiation table with his senior colleagues and seek joint solutions. "The group in Seimas has a fairly different opinion to G. Paluckas thoughts of departing the coalition with the "Farmers". There is no need to rush, instead everything needs to be looked at with more moderation. First of all there is a need to seek compromise between generations. Of course the Conservatives are doing far better – everything depends on how the party members accept young leaders. The Conservatives were also influenced by Vytautas Landsbergis' authority, but it later became apparent that G. Landsbergis is a capable individual who is able to find common ground. Meanwhile G. Paluckas came later, there is a large gap between the old and young generation. Much is also decided by differences in personality, not every individual is good at coming to compromise, ruling well. G. Paluckas is good at rhetoric, but his actions differ from his words. This is why a sort of distrust appears in the party," L. Šabajevaitė told LRT.lt. According to the VU docent, the Social Democrats have long needed to shift from rhetoric to actions. "It is unfortunate that there is no second party working seriously and trying to implement its principles, represent and defend a specific part of society, particularly in social issues," L. Šabajevaitė added. Furthermore T. Janeliūnas says that G. Paluckas may need to test on confidence in him in the party. "If the situation turns unfavourable for the Social Democrats and there is no rise or change in ratings, or if there is a decline, there will be no clear prospects for the LSDP to perform well during the next elections and criticism will mount that things are not going as they should, naturally G. Paluckas may need to test confidence in him. So far it is unclear because the coalition question is his first serious test. So far G. Paluckas is relying on the people who raised him into party chairmanship – members of the regional branches. Knowing their position on the coalition, G. Paluckas is trying to grow his influence. But will it be enough to resist criticism from party veterans and group members? That's an open question," T. Janeliūnas told LRT.lt. The political scientist believes that G. Paluckas needs the support of a broader team and primarily in the party itself. Furthermore the Social Democrats and their chairman need a clear vision of what they intend to do with the party in the long term and how to prepare it for future elections. "There was talk of ideological renewal, a different programme and a more socially oriented agenda. All of this needs to turn into something tangible. If not only G. Paluckas, but other influential Social Democrats take to such party reform and ideological reboot, it could unite the most important members of the party. Then it would be hard to criticise G. Paluckas at least until the elections because he would have a clear path," T. Janeliūnas stated.